Collaborators in Floriana Lombardi’s group in Chalmers University, Sweden, used high quality Pr1.85Ce0.15CuO4 superconducting thin films, grown in IQ researcher Patrick Fournier’s Laboratory for Advanced Epitaxy by Pulsed Laser Ablation, to fabricate narrow bridges acting as Josephson junctions. Such junctions were never done before with this family as their physical properties are extremely sensitive to the nanofabrication processes. The collaborators in Chalmers succeeded in fabricating sub-micron structures, with bridges as narrow as 100 nm. At these length scales, the bridges can act as Josephson junctions. In this paper, it was demonstrated first that hot spot formation in the nanobridges determines the critical current density, the limiting current it can carry without resistance. 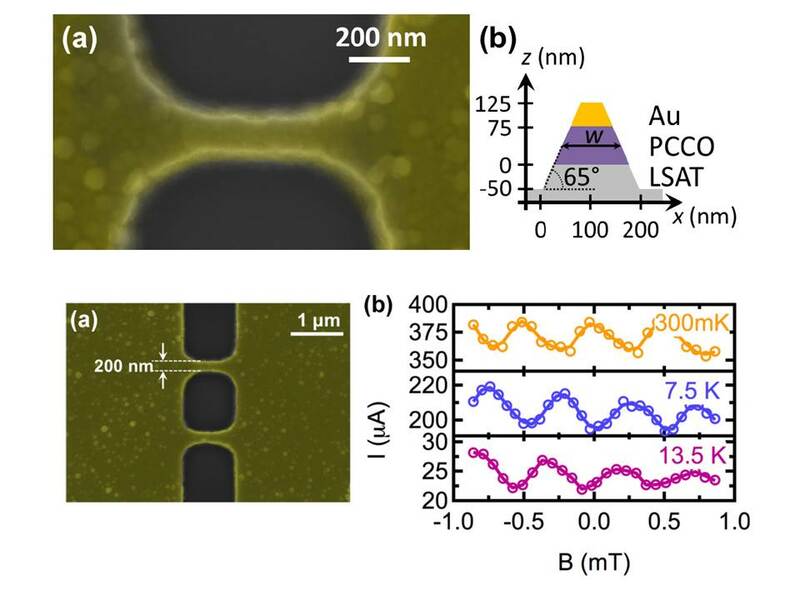 The switching effect occurring at large current could be of interest for designing superconducting nanowire single photon detectors. It was also shown that a geometry made of two parallel bridges between two separate electrodes, the so-called Dayem bridge, can act as superconducting quantum interference device (SQUID) with periodic field oscillations of its critical current. These oscillations are clear signature of the quantification of the magnetic flux within the loop. The measurements were done at various temperature to show the invariance of the field period, each period corresponding to the entrance/exit of one quantum of magnetic flux in the loop. Upper panels (a) SEM image of a Pr1.85Ce0.15CuO4 superconducting nanobridge acting as a Josephson junction. (b) Schematics of the thin films geometry across the nanobridge. Lower panels (a) SQUID in the Dayem bridge geometry. (b) Critical current oscillations as a function of applied magnetic field.